How much do people really know about efforts to improve the U.P.? I don’t usually get involved in online discussions. 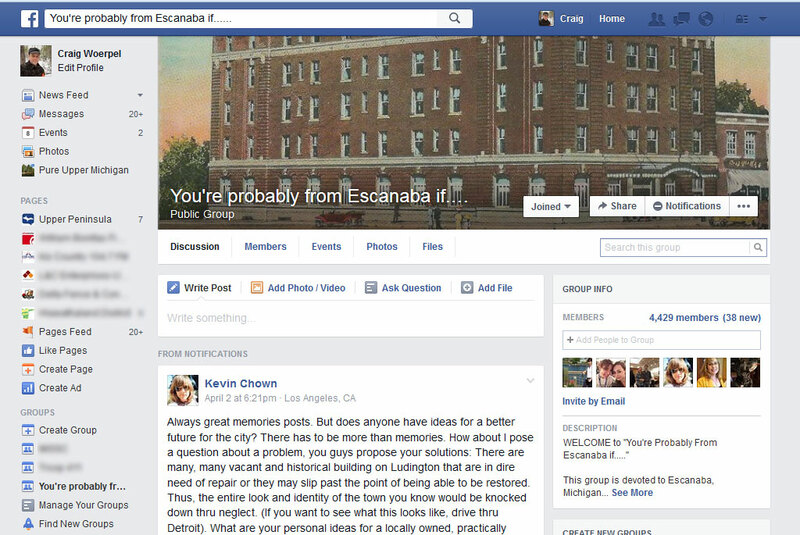 But yesterday I saw comments on a group Facebook page called “You’re probably from Escanaba if…” The moderator, Kevin Chown, asked a question that generated a lot of response. The question? What are your personal ideas for a locally owned, practically possible and community-based vision to restore what we simply already have before it dies forever? Kevin lives in Los Angeles. He grew up in Escanaba and often returns home to visit. I have seen him occasionally when he is in Escanaba and enjoy following his postings online. The discussion started with some good ideas – a business incubator, community walkways, renovating the downtown theaters. But it quickly deteriorated into the problems that face Escanaba. Now, don’t get me wrong. Escanaba has issues. Some were brought up during the discussion. But it became clear that some of those commenting were not aware of the things that were being done to improve the community. “Businesses that are in the tourist industry need to advertise to places other than the surrounding cities or states,” one person posted. You know those Pure Michigan ads that are so popular around the country? Escanaba actually has one. It was narrated by Tim Allen, the actor who voices the other Pure Michigan ads. The local Bays de Noc Convention & Visitors Bureau partners with U.P. and state groups to promote the area. It’s certainly not St. Louis but the Delta County Historical Society built a new museum and archive two years ago with a $1 million donation from a former Escanaba resident. Combined with the Sand Point Lighthouse, it is arguably the most popular tourist attraction in the community. “Is there a downtown development committee with business owners uniting?” asked another post. Actually, the Escanaba Downtown Partners in Business has been making great strides in promoting the downtown. It is a struggle but the effort is being made. But it was the comments that complained that Escanaba was not doing enough to promote economic development that caught my attention. “Escanaba is not a progressive town” said another. That’s when I decided to jump in. I wrote that the Escanaba Downtown Development Authority is planning to target eight buildings in the downtown as part of the Redevelopment Ready Communities program that the city recently became a part of. It was the lead story that day in my newscast. I thought that would be it but a business owner in Powers asked about the status of Escanaba’s Farmer’s Market, which has now been expanded to a Marketplace. I responded. The project was put on hold last year but is expected to move forward this year. That caused an exchange about the Marketplace, young people leaving the area, comparisons with other parts of the U.P. and the renovation of Ludington Street. After several posts a commentator still felt that Escanaba still had a lack of vision. Another asked how the city could attract a rich investor. “I still say, that the strength of our community is in people like you who have the courage to start their own business and invest in the community. They are the ones who serve on city and township boards. Are involved in service clubs. And volunteer for various causes and events in the area. “This is an incredibly giving community as you can see by the number of benefits to help people or programs in the area. Wendy Pepin, who I saw ‘liked’ one of my comments, is a prime example of that. What she gives to this community in music and charity support is incredible. “If you are looking for a theme or vision, it’s the history of the community that you like to talk about. The DDA is supporting signage to highlight the businesses that once were dominate in the downtown. The city recently had the downtown declared a historical district by the state in order to get money and preserve the historical aspect of our city. Which by the way is the timber industry. We are a logging town. That is why the paper mill is so important. “But there are many other smaller businesses. Besse Forest Products (a graduate of Escanaba), VanAire (a graduate of Gladstone), EMP (a graduate of Escanaba), Andex (a graduate of Escanaba), Classic Auto Collision (graduate of Escanaba), etc. “The sport fishing industry is huge for our area. I was laughed at in the late 1980s when I suggested that we focus on fishing and now look at what it gives us. And now there is an effort to create a fish farming industry in the county. A Canadian company is a possibility. The point of the original post was to encourage citizens to be involved in the direction of the community. That is certainly important. But I think there is a lot more happening to improve the U.P. than people might realize. I believe progress is being made. I am encouraged. Share the post "How much do people really know about efforts to improve the U.P.?"